We are delighted to announce the release of 6 wild birds from the EKPAZ Centre following the ministerial order to close it down, issued by Deputy Minister of Environment and Energy, Mr Socrates Famelos in October 2018. 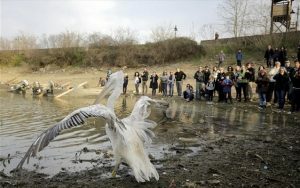 On Sunday the 24th of March at Lake Kerkini, northern Greece, 6 wild birds were released back into their native habitat. 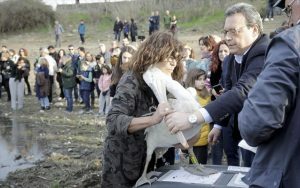 Under the direction of a special consultative committee of animal welfare experts, set up by the ministry, the birds were transferred from Aegina to Lake Kerkini. The transport costs were sponsored by Aegean Airlines and GAWF/Animal Action Hellas. Deputy Minister Famelos was present to witness the successful release. This is another step in the campaign to release or relocate all the wildlife still at the EKPAZ centre on Aegina. It is important to ensure the released animals will be able to survive in the wild, so the process has to be gradual and continuously reassessed. However we look forward to the removal of the remaining animals as soon as possible, and will continue to monitor the situation. You can read the full ministerial press release here. Over the last 9 years, several organisations and individuals with expertise in wildlife protection had been filing reports and complaints with every competent authority (Greek Ministries, Directorates, Prefecture of Attica) concerning the appalling state of the Greek Centre for the Protection of Wild Animals (EKPAZ) on Aegina. No effective action had been taken. The tragic result of the Centre’s downward spiral into dilapidation and debt was that a facility that started out proudly to provide sick or injured wild animals with rescue and recuperation care until they could be released into the wild, gradually turned into a nightmare of permanent captivity in deteriorating facilities. More than 11,200 people signed the change.org petition that we created in August 2018, aiming to take action on behalf of the animals suffering intolerable living conditions at EKPAZ. The surrender of all non-releasable animals to institutions and organisations that have the expertise and infrastructure needed to care for them properly and provide them with a suitable environment in which to live out the rest of their lives. At last, on 11th of October, the Deputy Minister of Environment and Energy, Mr. Socrates Famellos, issued a ruling revoking the operating license of EKPAZ. You can find the official decision published here. The decision was published through official channels a few days later. The withdrawal of the Centre’s operating license was a positive step by the Greek Government but to us this was only the beginning.